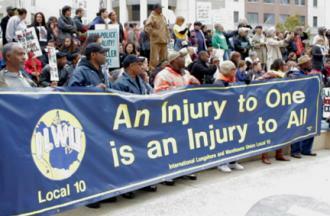 ILWU Local 10 at Oscar Grant Plaza in Oakland. They were marching in protest of racist police killings. The organizer of the “Patriot Prayer” racist and neo-fascist event in San Francisco, planned for tomorrow – Saturday, Aug. 26 – has cancelled his event. He cites concern over safety. But then he calls for people to show up at the rally “against Marxism” in Berkeley the very next day. How will safety be any less of a concern for Sunday? Could the real difference be that the Longshore workers’ union – ILWU – Local 10 voted unanimously to mobilize to stop then in San Francisco, including marching against them with the local banner? If I were one of those fascist/racist organizers, the very last thing I would want would be to be seen as opposing workers, to have the class question start to appear in opposition to them. Whatever was in this racist’s mind, it is all the more important for the unions – and their leadership – to mobilize against these groups. Update: It turns out they have just moved their event to Alamo Park in SF. Why they moved is unclear. Unfortunately, it has been reported that ILWU Local 10 has cancelled the stop-work day today and will be sending their members to work. I heard the news on NPR on the commute home, and my first thought was it was obviously due to the announcement that ILWU-Local 10 would be rallying. Organized labor cannot forget the lessons of history. Daniel Guerin, in his book Fascism and Big Business, makes a key point against the jingoistic trope employed by the German and Italian fascists to seduce their respective working classes. The fascists from both countries promised they would make the capitalists heel to the will of these nationalistic workers. In fact, as Guerin points out, the fascists lied and turned the tables on their early working class followers. The fascists got into bed with the capitalists with both screwing the workers. Labor in a big way must put its foot down and drown out the vicious idiocy of this generation of bigots.